You are here: Home › News › Patios! It used to be that if you went to a bar in Riverwest, you would get one thing — a dank, stinky seasonless hole in the wall — and it was great. We just didn’t know any better. Then, a few years ago, a bartender at an unnamed establishment did a strange thing, opening a window on a hot July day. It caused a stir. Not to be outdone, however, was a rival establishment, whose crafty barista devised a strategy to prop open their front door. It was a solid hit to the opposition, the patrons loved it, and the Fresh Air War was on. Battles raged that summer, and the combat lines spread for a mile. Then, about three years ago, the coup de grace. Someone had the crazy idea to put chairs outside, and the idea hit like a bio-bomb, spreading patio fever to all the locals. 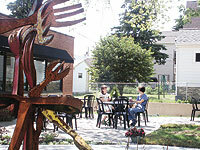 For the Riverwest citizen, the lucky aftermath of this war is outdoor seating almost everywhere. Some establishments simply plunked tables and chairs on the sidewalk or an errant patch of grass. Other places had the means and the space to get fancy, creating more durable structures. Whatever the case, these war spoils are really getting good use, at least when it’s not raining, and there’s probably still a few who would happily defend their outdoor position straight through the downpour anyway. The Little Foundation 2718 N. Bremen St. Fuel Cafe 818 E. Center St. Nessun Dorma 2778 N. Weil St. Rick and Donnas Bremen Cafe 901 E. Clarke St. Circle A 932 E Chambers St. River horse 701 E. Center St. Art Bar 722 E. Burleigh St. The Big The Tracks 1020 E. Locust St. Onopa 735 E. Center St. Mondo Bros. 2730 N. Humboldt Blvd. Closet Classics Caffeine & Clothing 1000 E North Ave. Uptowner 1032 E. Center St. The Mad Planet 533 E. Center St.